Elizabeth Crook, author of "Monday Monday", at the KUT Studios. There are few incidents in Texas history as compelling as the UT Tower shooting. On August 1, 1966, a UT student and ex-marine named Charles Whitman climbed to the top of the UT Tower and opened fire on the pedestrians below. 16 people were killed. Dozens were injured. It was the first mass shooting on a US college campus. And it changed many lives. 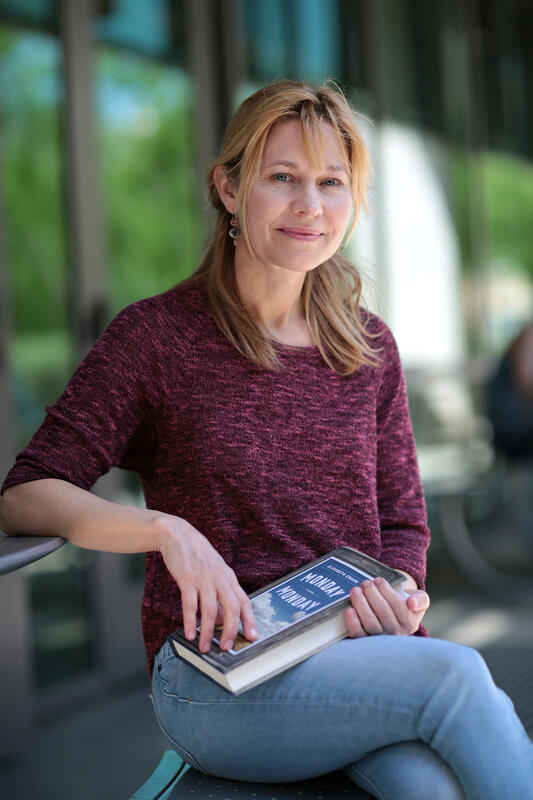 Austin novelist Elizabeth Crook has used the events of that day to craft a vivid and emotional novel, "Monday, Monday." She told KUT's Emily Donahue that she felt some qualms about her subject matter. She began writing in 2006. And as she wrote, several school shootings occurred, from Virginia Tech to Sandy Hook. "Suddenly I knew I was dealing with, you know, not just with a historic event but a national situation," Crook says. "On the news you see these people who are affected by these events interviewed immediately for the first maybe three or four days. But we don't know what happens 40 years later to people who were wounded, whose lives were completely taken off course." Crook says she wanted to follow the 40 years in the lives of her three main characters that came after the shooting. Shelley Maddox is an average girl who wants to apply to the Peace Corps. She is shot by Charles Whitman before she is able to cross the Plaza on the South Mall. Shelley is rescued by two cousins, Wyatt and Jack. Jack is also wounded. Wyatt drags Shelley behind a bush to shield her from Whitman's gaze and the burning sun. Crook says she was particularly interested in exploring the emotional ties created through surviving a traumatic event. The Boston Marathon bombings, she said, created so many bonds between strangers. "One other interesting thing about the Boston incident that I felt so touching and tragic was the fact that so many people afterwards wondered why they had not gone to help; why other people were running toward the tragedy while they were running away from it and then questioned what that meant about them and were disturbed," she says. …And later, in a number of different ways tried to make that right." "Monday Monday" hits stores April 29. Crook will be at Austin's BookPeople that Tuesday at 7 p.m.
On the Bard's Birthday, Who Wrote It: Shakespeare or a Rapper? It's happened to all of us: just when you're ready to deliver the perfect rebuttal, last word or final point, your tongue trips up and you slaughter your English. Don't fret about it, says author Ammon Shea. The man who spent a year reading the Oxford English Dictionary is taking on grammarians and nitpickers alike. Shea's new book "Bad English: A History of Linguistic Aggravation" (out this June) is an eye-opening look at how language mistakes have become accepted as correct usage. The novel "The Burgess Boys" took the nation by storm last year. This month, the novel is available in paperback. The follow-up to Elizabeth Strout’s Pulitzer Prize winning novel "Olive Kitteridge" spent weeks atop the New York Times bestseller list and months making the rounds of book-circles. Elizabeth Strout visited with the Texas Standard's Emily Donahue to talk about her book. Listen to their conversation in the audio player below. A young man about to go to war meets a young woman. They fall in love. A reckless, passionate affair follows. It lasts just a week, but it reverberates through six lifetimes. That's just one layer of the narrative in a new novel by Austin author Justin Go. “The Steady Running of the Hour” includes a race against time and crosses two centuries and multiple continents – from the drawing rooms of London to the horror of World War I battlefields – through Europe, Asia and the U.S.